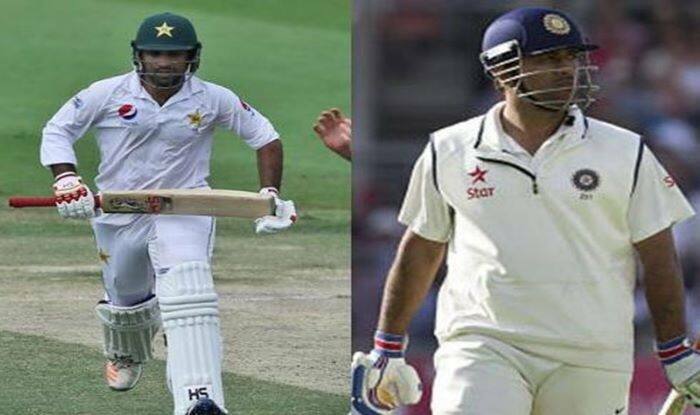 South Africa vs Pakistan, 3rd Test: Pakistan skipper Sarfraz Ahmed surpassed former India captain MS Dhoni and former Australia wicketkeeper to create a world record. South Africa vs Pakistan, 3rd Test: Pakistan skipper Sarfraz Ahmed surpassed former India captain MS Dhoni and former Australia wicketkeeper to create a world record. By taking six catches in the second innings, he took a total of ten catches in the ongoing third Test versus South Africa becoming the only wicketkeeper to do it. With this, he went past Alec Stewart, Adam Gilchrist and MS Dhoni who all have taken eight catches. The feat was achieved on Day 3 of the Test, on a day in which Quinton De Kock slammed a brilliant 129 that helped South Africa set a formidable target of 381. Faheem Ashraf and Shadab Khan were the pick of the Pakistan bowlers in the second innings as they bagged three wickets apiece. The visitor’s got off to a dream start in the second innings as they reduced Proteas to 100 for five in 29 overs before Hashim Amla and De Kock stitched a gritty 103-run stand. Amla scored a patient 71 off 144, while the wicketkeeper-batsman laced 18 fours and a six to score his fourth Test century. The pair’s effort helped South Africa post a target of 381. Meanwhile, Pakistan has resumed chase and are 74/2. They have lost their openers Imam (35) and Shan Masood (37) to Dale Steyn, who also went past Richard Hadlee’s tally of 432 Test wickets. Azhar Ali and Asad Shafiq have just walked into the middle as Pakistan still need 307 runs to win. The duo has a mountain to climb.